Apex 1/4'' hex insert drive nutsetter, metric, for sheet metal screws, magnetic, 6 point square opening. Magnetic nutsetters from Apex Fastener Tools formally Cooper Tools, are built to hold the fastener in driving position, even when working straight down. Time-wasting motions are eliminated when starting fasteners or working in hard-to-reach areas. These nutsetters are identified with a M prefix. Hex drive nutsetters from Apex Fastener Tools formally Cooper Tools, allow nutrunning in all types of applications. Nutsetters from Apex Fastener Tools feature a durable design and are constructed for a long service life. 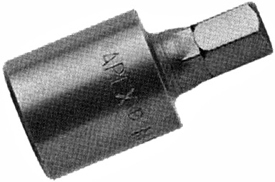 Apex nutsetters have hex tolerances that are on average 48% tighter than DIN and 35% tighter than ANSI requirements. With Apex you are assured of an exact, sure fit. All nutsetters from Apex Fastener Tools have the tightest tolerances for straightness and concentricity in the industry. Apex nutsetters are specifically designed and manufactured for high impact use, and made from a tougher and more ductile alloy steel which is then heat treated for extra durability. The MHM-7MM Apex 7mm Magnetic Metric Nutsetter, For Sheet Metal Screws, 1/4'' Insert Drive is one of thousands of quality tooling products available from MRO Tools. Please browse Apex 1/4'' Insert Drive Nutsetters, SAE, Metric, For Sheet Metal Screws for tools similar to the MHM-7MM Apex 7mm Magnetic Metric Nutsetter, For Sheet Metal Screws, 1/4'' Insert Drive. MHM-7MM Apex 7mm Magnetic Metric Nutsetter, For Sheet Metal Screws, 1/4'' Insert Drive description summary: Apex 7mm magnetic metric nutsetter, for sheet metal screws, 1/4'' insert drive.Opening Size: 7mm Overall Length: 31.8mm Socket Nose Diameter: 11.1mm Special Notes: Magnetic Quantity discounts may be available for the MHM-7MM Apex 7mm Magnetic Metric Nutsetter, For Sheet Metal Screws, 1/4'' Insert Drive. Please contact MRO Tools for details.